The Barry Drum Manufacturing Co. catalog described their collapsible bass drum as “a marvel of convenience for the drummer who travels” – and it was. The drum could be completely set up in three minutes, and taken down in one. And the 14×28 model weighed only 12½ pounds. It folded up into a fraction of its full size and fit compactly into a hard vulcanized case measuring 10” at its widest spot. Plenty of room was left in the center of the case for a snare drum, traps,and the bass drum extension rods. With this hand piece of luggage, plus a compact Barry trap case for stands and cymbals, a drummer could comfortably carry a complete two-piece outfit in both hands. To look upon a Barry Collapsible Bass Drum is to behold a work of art. Its combination of unique design plus quality of material and workmanship give it an extraordinary and striking appearance. Let’s take a look at the intricacies and beauty of how it was put together. The highly polished and finished sheet-aluminum shell consisted of four sections. Hinges that were mounted to the shell’s inner wall connected the sections together, except at one joint, where two sections could be disconnected and separated from one another. The shell could then be collapsed by simply rolling it up inside itself into an elliptical shape. To join the shell back together, three metal pins protruding from the end of one disengaging section fit snugly into openings in the other section. (See figure 3 below.) Oak strips inside the shell were used for anchoring and bushing the hinges and also for coupling the separating joint. With heads and tension rods securely in place, the drum held tightly together and was every bit as sturdy as a solid-shelled drum. The die-cast decorative rims, also highly polished and finished, were each built in four hinge-connected sections. Hinges and lugs were cast directly into the structure of the rims. Two of the four hinges, positioned 180 degrees apart from each other, pivoted along the narrow edge of the rim that faced the shell. The other two hinges, also 180 degrees apart, pivoted along the outer broad side of the rim. This moving-joint arrangement allowed the rim and head to fold first completely in half, and then further into a configuration that looked, amusingly, like an oversized hat. The rims also served to accommodate the clamp-on removable bass drum spurs. As for the heads, yes, they too were collapsible. Made from the beat heavy-gauge hides available, the heads were specially adapted and treated for use with the collapsible bass drum. Instead of being hoop-tucked, they secured directly into the rims of the drum, fitting “sandwich-style” between a metal band and a recess in each rim. Small screws then held them in place. To facilitate folding, sections of the head close to the pivot points of the hinges were cut out. Edges of the heads around these points were hemmed and stitched to provide added durability. Twelve manganese-aluminum tension rods – with thumbscrews located at both ends of each rod – could simultaneously tension both heads from the front or back of the drum. For quick disassembly, the thumbscrews were loosened and the rods lifted right out of slotted lugs in the rims. As you can see, the design of the Barry Collapsible Bass Drum was quite an engineering achievement. But what kind of tone quality could be expected from a drum that literally came apart at the seams? The news is good: There was no sacrifice of tone to accommodate the drum’s collapsibility. Amazing as it seems, this bass drum was endowed with a well-balanced blend of warmth, sensitivity, and full-bodied depth. Historical background on the Barry Drum Manufacturing Co. is limited. We do know that William A. Barry invented the collapsible bass drum and patented it on April 17, 1917. Barry started doing business in December of 1919, and – according to Bill Reamer, proprietor of Drummers Service – continued up through at least the late 1930’s. (As a teenager, Reamer worked weekends with Barry, doing odd jobs at his retail store between the years of 1935 and 1938.) The original factory was located at 3426 Market Street, in Philadelphia, Pennsylvania. Later, the manufacturing operations were moved to the company’s retail store, also on Market Street. 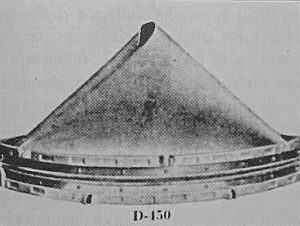 How well did drummers of the early 1900s take to the Collapsible Bass Drum? We can only speculate that is present-day rarity might indicate that not many were produced and sold. But what is a drum like this worth today? Due to the scarcity of Barry Bass Drums, only a scant few have surfaced on the retail vintage drum market. As a result, a track record of what collectors are actually will to pay for this drum has yet to be established. Until then, my estimate of between $700 and $1,300 is based on my overall knowledge of what vintage drums sell for according to their degree of rarity, aesthetic and collectible appeal, and historic significance – along with marketplace trends. Other American drum makers of the early 1900s also produced “traveling” bass drums. George B. Stone & Son featured a metal trap door built right into the drum’s shell. The Walberg & Auge version had a shell divided into two cylindrical sections connected together by latches and hinges; the drum opened and closed like a trunk. Both of these designs permitted a snare drum, cymbals, and other traps to be stored and carried inside the bass drum, but the Barry design was the most adventurous. According to Dave Seville, editor of the Old Drummers Club newsletter in Sheffield, England, collapsible bass drums were also offered in the late 1920s by English drum manufacturer and distributor John E. Dallas & Sons, Ltd. The inventive spirit that went into the making of the Barry Collapsible Bass Drum is a tribute to the rich heritage and quality that vintage drums offer us as collectors and players of these fine instruments. It’s my hope that as the fast-growing trend of vintage drum collecting continues to gain momentum, many thousands of these hidden treasures will be discovered. Photos courtesy of Gary Miller, Bob Gorman, and Bill Reamer.